Indian duo Divya Deshmukh (7.0) and Michelle Catherina (6.5) brought home a double delight as they achieved their maiden Norms after the ninth round of the Velammal -AICF Women International Grandmaster Round Robin Chess tournament 2019 at Hotel Abu Sarovar Portico, Chennai here today. The win also takes Divya into sole lead at 7.0 points with two rounds to go. Michelle Catherina (India) & Osmak Iuilja (Ukraine) share the second spot at 6.5 points. Divya made her International Master Norm & WGM Norm in one go, scoring over WGM Babiy Olga (Ukraine), while Michelle achieved her nine game WGM Norm with a safe draw against fellow Indian Aakanksha Hagawane. Both needed draws for their respective WGM Norms and Michelle split her points early, against Aakanksha Hagawane in an interesting Ruy Lopez game that lasted 30 moves. 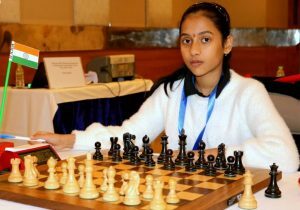 Divya, who too needed to a draw to achieve her Norm went one step further, defeating WGM Babiy Olga (Ukraine) in a hard fought game that lasted four hours and twenty minutes after 92 moves. Hats off to the Nagpur girl Divya, who went all out and delivered when it mattered. In other games, Chandreyee Hajra went down to Osmak Iulija of Ukraine, while the other two games between Munguntuul – Nakhbayeva, Sapale – Uuriintuya ended in draws. Sunday will witness the penultimate round, as the event concludes on Monday 4th Feb, 2019.